For formal reviews please click the REVIEWS tab above. So I’ve been getting some pretty cool feedback from my readers. Some of them are pretty entertaining. “My husband bought [Beyond Justice] in the mail after work, got your book from Amazon…he’s been reading it all night and can’t put it down. He says it’s so exciting….I don’t think it’ll be long before I get my turn. “Oh Joshua, that was the worse book ever!!! lol It took me like 36 hours to read your book and I balwed like a baby! yep the last 2 pages I had such a hard time reading through tears!! You can get your copy of BEYOND JUSTICE at Amazon.com in both paperback and Kindle edition. BEYOND JUSTICE is also available at the Apple iBooks store. 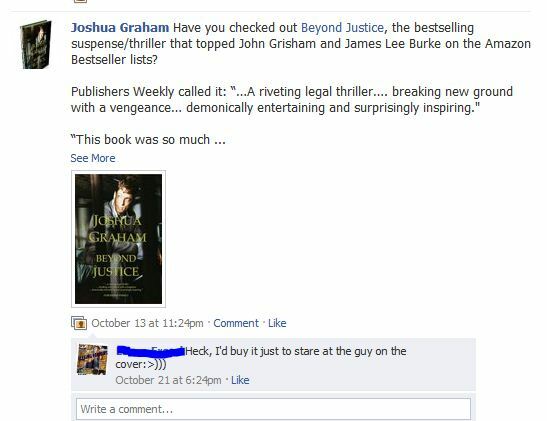 Thanks for helping make BEYOND JUSTICE the next bestseller!